Consider this: when Marvel first reintroduced Captain America in Avengers #4, he'd only been frozen for about 20 years - not really a huge chunk of time; the world of the '60s wasn't that different from the world of the '40s, all things considered. These days the gap would be 70 years - now that's a massive cultural shift! Steve Rogers grew up as a scrawny kid - just skin, bones and an irrepressible desire to rid the world of evil. 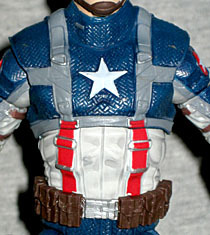 Such a hunger for justice led him to volunteer his body for a top-secret and highly experimental super-soldier program. This program strengthened his body and emboldened his will. This program turned Steve Rogers into the noblest Super Hero the world has ever seen: Captain America! When the movie costume was revealed, some folks complained that it looked too modern, that it was unreal for the era. And that's partially true, but it fails to take into account two things we couldn't possibly have known at the time: in-universe, the suit was constructed by Howard Stark, a man with an eye on the future; and in reality, the costume department used period-accurate materials to construct it. Instead of chainmail, the blue parts of his costume are a herringbone nylon material, and the straps/suspenders running over his chest are the same sort parachutes used. It's a really good sculpt, and the detail has been preserved well during the molding process. 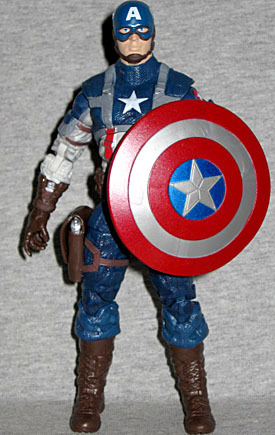 When this figure was shown off at Toy Fair 2011 (along with the 6" Thor), there was an unmasked head on its shoulders. That didn't make it to this release, but what little likeness there is is fine - it certainly looks no less like Chris Evans than the Human Torch figures did. Still, when all you have is a nose and lips, it's hard to judge one way or the other. The articulation is very good. 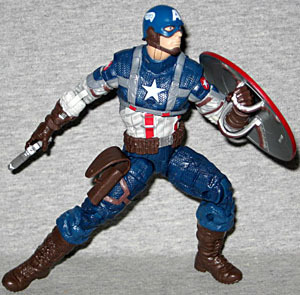 Cap has a balljointed head, hinged neck, swivel/hinge shoulders, swivel biceps, double elbows, swivel/hinge wrists, balljointed torso, swivel/hinge hips, swivel thighs, double-hinged knees and swivel/hinge ankles. The shoulders don't want to let the arms down as low as they should, but that's our only complaint. The joints are well designed and sturdy, and nothing was stuck or bent when he came out of the package. 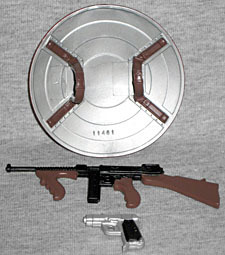 The figure comes with three accessories: a pistol, a machine gun and his shield. And surprisingly, all three of them are new molds! The shield is the movie design, of course, which means the star in the center is done in five pieces, and the "white" parts are actually closer to silver. The back has stiff straps that appear to be riveted in place - so the straps will fit over Cap's arm and will stay in place, but don't expect to attach it to his back or anything. The pistol is an exaggerated Colt M1911A1, and fits in the working holster on his right leg. The Tommy gun has a straight ammo clip and a forward grip. This figure is a Walmart exclusive, and though it was hard to find at first, the stores that did get them in have put them on the after-Christmas clearance, so you can pick him up for about $8 right now. He's a good figure, if a bit short at 6" even. A highly detailed sculpt, strong articulation, smart accessories... if this is what we have to look forward to when Marvel Legends comes back this year, then we're in for a treat.